One of the most common diseases in the mouth is what we call "periodontal disease", is a disease of the gum and bone around the teeth, not the teeth themselves. You could have perfectly healthy teeth, no cavities, no fractures even white and beautiful but with periodontal disease, that tooth or those teeth can be lost. So what is periodontal disease; on the early 20's a person normally has no effect in the mouth and what we see is the transparency of the teeth anchored on the bones with the gums on top of it. Most of the teeth are anchored from the root to the bone. The gum starts where it physically meets the tooth and the little pockets around it. These pockets are where people differ on the way the brush or floss the teeth, even if you go to a dentist the genetic factor plays an important role, for example; some people hardly brush or floss and yet they have no problems with the disease, but this is just a few of us, but most of us brush and floss everyday and still get challenged with the periodontal disease. Periodontal disease starts when the gums gets irritated and the bleeding starts easily; we know this as gingivitis which is reversible but, if the plaques are there long enough along with the bacteria the infection spreads to the bone causing it to dissolve away. Finally when the dissolve starts the pockets around the teeth start to grow and they become deeper which in the end will let more food trapped in and creating more bacteria that causes even more damage to the bone. The reasons why this disease is so hard to treat are; first of all that is silent, it causes no pain on people and second of all it cannot be fixed when its already there. The only thing we can do to treat this disease is prevent further damage, by first doing what we call a deep cleaning, starting with the gum which in two or three months will reduce it sizes, so basically the patient needs to maintain a good oral hygiene at home. Ask Dr. Muradian about prevention treatments and for an oral hygiene plan against gingivitis. Do not forget to regularly schedule a professional dental cleaning at our Simi Valley office to remove plaque, tartar and fight infection. It's the best insurance there is for your oral health! (805) 522-0880. Periodontal disease, sometimes referred to as gum disease, is a condition that attacks your gums and can destroy the bone that supports the teeth. The gum disease starts with plaque build-up that turns into calculus, developing both above and below the gum line. Because of this, pockets begin to form allowing for more bacteria to enter the area, which causes the destruction of the teeth. Our Simi Valley dentist, Dr. Muradian, has the knowledge and experience necessary to treat the gum disease. Periodontal disease can be detrimental to your oral health if the condition is not treated accordingly. Excellent oral care habits, good nutrition and routine visits to see our Simi Valley dentist are ways to reduce your risk of developing gum disease. This first phase is the most common, but it is also reversible. 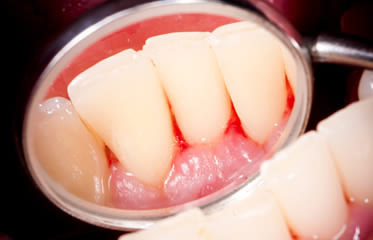 In this phase of gum disease, gingivitis has progressed to a more severe state known as periodontitis. The result is damage to the soft tissues of the gum and loss of the bone that holds the teeth. This last phase of periodontal disease is the most serious one, and it involves an irreversible loss of bone and the rest of tissues that support the tooth. Teeth mobility is high and due to that, an extraction may be necessary to eliminate the infection. Periodontal disease can be a long and tedious process that can turn what was once a beautiful smile into a mouth that requires surgical procedures. But this does not have to be the case, knowing and recognizing the symptoms in time allows you to prevent the irreversible damages caused by this disease. In the early stages of gum disease, most treatments are non-surgical procedures. However, in more advanced stages, surgical procedures must often be used. If gum disease is more advanced and reaches the root of the teeth, the sick periodontal bags and gum infection can be treated. A dental hygienist will use an ultrasonic scraping device to remove plaque, tartar and food scraps above and below the gum line. Then, the dental hygienist will manually scale the surface of the teeth and roots so they can be soft and disease-free. Laser treatments are also sometimes used to remove tartar deposits. If the periodontal pockets are more than 5 millimeters deep, (that is, if you have moderate to severe periodontitis), gingival flap surgery can be performed by a periodontist to reduce periodontal pockets, as well as a bone graft to restore the bone loss. Please contact our dental office in Simi Valley, CA for a periodontal disease evaluation should you have any of the gum disease symptoms above. Feel free to call us for more information on periodontal disease.